You’ve reached the online center for IT4IT Foundation training and Certification. The purpose of this IT4IT Foundation course is to provide validation that the candidate has gained knowledge of the terminology, structure, and basic concepts of the IT4IT Standard in order to pass the IT4IT Foundation (level 1) exam. In addition, students must understand the core principles of the IT4IT Reference Architecture and the IT Value Chain. Our professional and engaging e-learning course offers you an opportunity to self-pace your learning and reduce costs. For information on a site-license, please contact us to speak with a member of our sales team. With this course, you’ll receive 6 months access from the date of purchase as well as a FREE exam voucher to use whenever you are ready to sit the IT4IT Level 1 exam! The purpose of learning IT4IT Level 1, known as IT4IT Foundation, is to provide validation that the Candidate has gained knowledge of the terminology, structure, and basic concepts of the IT4IT standard, and understands the core principles of the IT4IT Reference Architecture and the IT Value Chain. The course will have an overview of the IT4IT standard, cover the basics and the core concepts and study the four value streams in depth: Strategy to Portfolio, Requirement to Deploy, Request to Fulfill and Detect to Correct. Why Study IT4IT Foundation with 4PA ? 4PA is an accredited global training provider for IT4IT. The course is accredited by The Open Group and meets all of the learning requirements required for IT4IT certification at foundation level. Our courses are easy-to-use. Students will benefit from an interactive multimedia environment that enhances the way you study TOGAF. Released in Q4 2015, The Open Group IT4IT Reference Architecture standard is focused on defining, sourcing, consuming, and managing IT services. The IT4IT standard reduces cost, simplifies, and brings end-to-end traceability to your IT production.. In short, the IT4IT standard enables IT management to work across the entire Value Chain in a better, faster, and cheaper way with less risk. Why Adopt the IT4IT Standard for Your Organization? With the IT4IT standard, The Open Group members have produced a practical and usable piece of work that underpins and enhances things like COBIT®, ITIL®, ISO, CMMI, and Agile, and it relates directly to TOGAF® 9 and ArchiMate®. Borrowing from the management principles that transformed manufacturing, the IT4IT standard consists of a formal IT operating model, based on the value chain approach, known as the IT Value Chain, and a three-level functional reference architecture encompassing four major IT value streams. Why does IT need the IT4IT Standard? The IT4IT Reference Architecture provides prescriptive guidance to design, source, and manage services in a business value chain-based framework called the IT Value Chain. Applying value chain thinking to your operations allows you to see where your weaknesses are, where the bottlenecks are and where your greatest opportunities are to improve. It gives you prescriptive guidance on how to manage your service models and life-cycles, and what kind of systems to put in place. The data-driven IT4IT Reference Architecture enables insight for agile improvement that brings an increased IT focus on business outcomes. In the course, you will learn about the terminology, structure, and basic concepts of the IT4IT standard, as well as understanding the core principles of the IT4IT Reference Architecture and the IT Value Chain. The course has been designed for Business Leaders, Enterprise Architects, Developers, IT Engineers, IT Operations, and anyone with an interest in enabling IT management to work across the entire Value Chain in a better, faster, and cheaper way with less risk. Browse the contents of this eLearning course by clicking on a module title below that you would like to know more about. Visit our exams page to find out more about sitting the IT4IT Foundation (level 1) exam. The purpose of this Learning Unit is to help the Candidate understand the IT4IT Reference Architecture at an overview level. The purpose of this Learning Unit is to help the Candidate understand the key terminology of the IT4IT Reference Architecture standard. It is expected that these definitions would be covered as part of the learning in other units. The purpose of this Learning Unit is to help the Candidate understand the Basic Concepts of IT4IT Value Streams and the IT4IT Reference Architecture. The purpose of this Learning Unit is to help the Candidate understand the IT4IT Reference Architecture at a high level. The purpose of this Learning Unit is to help the Candidate understand the objectives and functional components of the Strategy to Portfolio value stream. The purpose of this Learning Unit is to help the Candidate understand the objectives and functional components of the Requirement to Deploy value stream. The purpose of this Learning Unit is to help the Candidate understand the objectives and functional components of the Request to Fulfill value stream. The purpose of this Learning Unit is to help the Candidate understand the objectives and functional components model of the Detect to Correct value stream. The purpose of this Learning Unit is to help the Candidate understand the IT4IT Certification Program.  Explain the IT4IT Certification Program, and distinguish between the levels of certification. If you’d like to sit your IT4IT Foundation exam you can find everything you need to know on this page! When you think you are ready to book your exam, you can check if you are ready by taking our practice exam supplied with each course. It’s modeled directly on the real thing and is a great way to check your preparedness before you book your exam. Pearson Vue are the authorized providers of exams for TOGAF 9, IT4IT, and ArchiMate Certification. Each eLearning course comes with a revision module that gives you an overview of the course and the key principles and concepts that you need to understand in order to pass the IT4IT Foundation exam. Our IT4IT course comes with a FREE exam voucher that can be used to schedule your exam. When you think you’re ready, just contact us and we’ll order your exam voucher. This exam is the first part of a 2-part certification process for IT4IT Certification and can be taken after the completing the IT4IT Foundation e-Learning course. Once you have completed the IT4IT Foundation training course, you can contact 4pa e-learning support and request your free exam voucher which can be used at any Pearson Vue test center within 12 a month period. 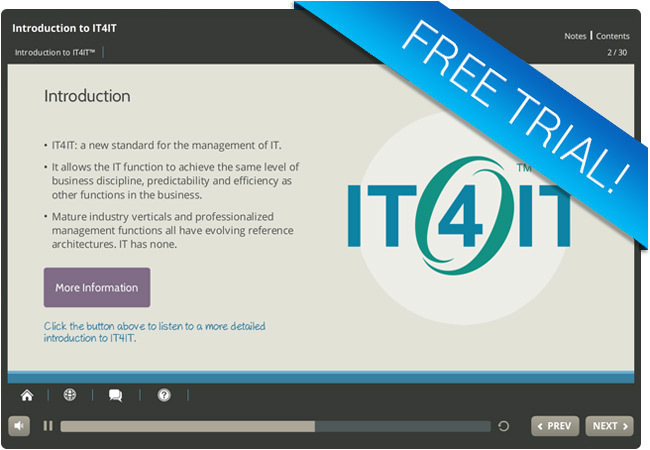 Why not try out a free trial module from our IT4IT Foundation eLearning course! In this IT4IT Foundation trial module, you will learn how to understand at a high level, the core concepts and make-up of the IT4IT standard, including the IT Value Chain, the Four IT Value Streams, and the IT4IT Reference Architecture. There’s also a free quiz at the end for you to test your knowledge! Like the full IT4IT Foundation eLearning course, you can access this free trial module from any device whether you are at home, at work, or on the move! For information on an IT4IT site-license, please contact us today to speak with a member of our sales team.